It's official. Maple Leaf Gardens will become a grocery store. After years of speculation, the company also made the formal announcement to investors that it will develop a grocery store in downtown Toronto's famed Maple Leaf Gardens. "This is an icon, just like Loblaws is an icon. I think it represents a huge evolution of what's happening to Loblaws, as well as what's happening in Toronto," said Galen Weston Sr. The arena has been empty since the Toronto Maple Leafs hockey club moved to the Air Canada Centre in 1999. Weston Jr. said the company will begin to clean up the building this summer, with plans to reopen the doors in 22 months. I'm not one of those guys who's going to throw up his arms and declare this blasphemous. 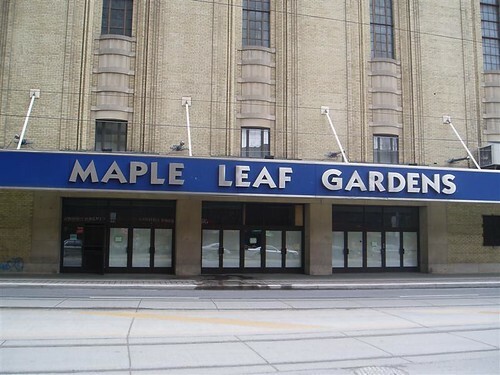 I have many great memories of Maple Leaf Gardens, and I sometimes walk by the old building on Carlton Street just to see how's she's going, but I'm a realist. I understand MLSE sold the building with one of the conditions being that it can't host hockey. If it can't be a skating rink, I just want it to be something useful that keeps as much of the facade as possible. I'm sure Loblaws will do a great job restoring MLG and at least I'll be able to get back inside again. Besides, the people buying all those new condos in the area are going to need a place to buy milk and bread.